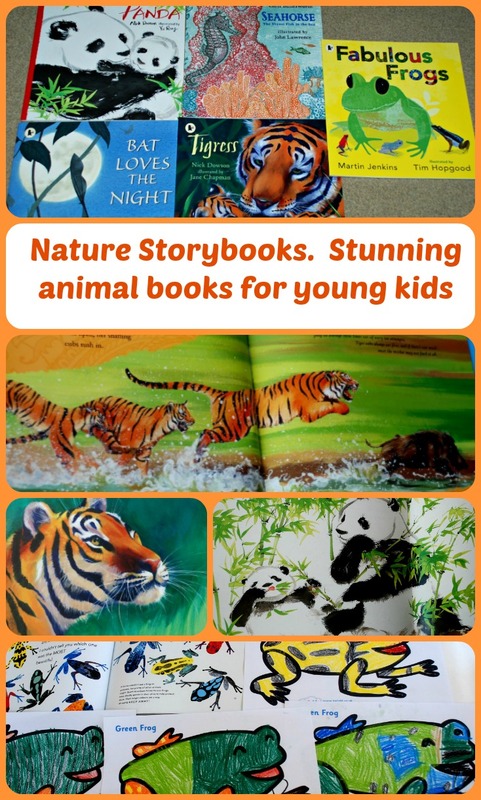 We have been fans of the Nature Storybook range for some time now. We own 3 of the books –Yucky Worms, Big Blue Whale and The Emperor’s Egg – and both my kids love all 3 books. We have read the stories multiple times and with all 3 stories the kids have learnt about the animals involved. My daughter also regularly chooses these books as stories to read to her younger brother which for me means win-win as far as books go. So I was thrilled when Walker Publishing sent us 5 new Nature Storybooks. All 5 books are a great addition to the kids bookshelf. The books are written and illustrated in a style which suits each individual animal (there is no one formula applied to each book they are all individual and unique). The Tigress book contains lots of vivid illustrations of the tigress and her cubs, lots of orange, green and yellow through the book. Whereas the Tracks of the Panda is more white/ black with some green yet they are both incredibly striking books. The Tracks of a Panda book starts with a young Panda cub being born and how the young panda cub is really small and fragile at first and then how the mother and cub end up having to move territories to find more food. The Tigress book also follows a mom and her young but the differences between these two animals is very clear in the different books. Even though both books are written by the same author (Nick Dowson) and both are about a mother and her young the way it is written and illustrated you really get the differences in lifestyles and natures of these two amazing animals. Each book contains lots of information and I have to be honest and say that I have learnt something new about each animal from reading the books. The information is not too dry or too advance for the kids, both of mine (aged 5.5 and 8) have found the books informative but in a nice relaxed manner. They are not encyclopedias on the animals (so don’t expect each book to contain every last fact about the animal that it is based on), they are stories about animals with facts included. The Fabulous Frog books is great as it is not about the frog life cycle but rather focuses on the many different types of frogs (I never realised you got so many different frogs and how different they all look). This lovely book spurred my kids on to create their own versions of colourful frogs. Disclosure: As I mentioned above 3 of the books I have included in the post were purchased by me but our 5 new Nature Storybooks were sent to me by Walker Publishing after I requested copies for us to use as part of our learning about animals. All opinions expressed about the books are mine (or my children’s). This entry was posted in Book Ideas and tagged animal books, children's book, home education, homeschooling, learning about animals, Nature Storybooks. Bookmark the permalink.